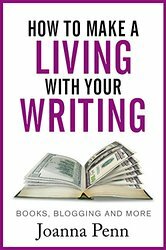 Previously, I wrote about how being a full time writer is very much about being an entrepreneur, but not the same kind of business person as found in other industries. I said that, when I started out, I had to do a lot on a trial-and-error basis, because I couldn’t find a lot of advice specific to what I was doing. There are an abundance of books on writing, and an immeasurable amount of books on business, but not many on the business of writing. Well, I’ve since found a series of books by Joanna Penn. Related Article: The ‘Business’ of Writing, by Rachel McGrath.